Bari J. Ackerman was a Spoonflower customer at the beginning, back when Spoonflower was still brand-new and we were running things on our back porch and dining room table. (Old video of what a fabric printing start-up looks like here.) We thought Bari's luscious floral designs were just gorgeous, and it was no surprise to me to see that her collection, called "Full Bloom," was snapped up by Windham Fabrics. I thought some of you would-be design professionals would be interested in hearing more about Bari got started as a professional fabric designer, and she graciously agreed to be interviewed by email. Me: Congratulations on your new fabric line, Full Bloom! I was so thrilled to see some of your lovely designs for sale in two of my favorite on-line fabric shops, Pink Chalk Fabrics and the Fat Quarter Shop. Can you talk about how you got started designing fabric? Bari J.: Thank you! I had wanted to design fabric for a long time, but didn't have the confidence to jump in. Then in March 2008, I was at the Country Living women Entrepreneur event in Chicago. The key note speaker had us write down what we wanted and say it out loud. This gave me just the push I needed. When I got home, I said it out loud on my blog which really made it real. I had been working on various designs for quite a while, so I had a lot done already. By October, I had the line licensed. Have you always worked in the design field? Do you have any formal art or design training? I do not have formal art or design training, but I did work as a graphic designer and copy writer before I had kids and then later designed jewelry and collage art from found objects before I started sewing and created my business, Bari J. I'm self-taught which means A, I learn things the hard way, and B, I'm ridiculously stubborn. Your designs feature lots of big, luscious flowers and other natural motifs, and they strike me as very painterly. Do your designs originate as paintings? How do you create them? Each of my designs are drawn by hand…but not on paper. I start with a drawing that I put straight into the computer. What did you do to get "noticed" by a big fabric house? How did Spoonflower fit into this process for you? I had my designs printed by Spoonflower, made appointments with art directors at various companies and showed a finished quilt and other small items finished in my fabrics at Quilt Market. Honestly, I do not think it would have shown in the same way on paper, so Spoonflower was really instrumental in my success. What advice do you have for other would-be professional designers who are trying to get their work picked up? I would say that it is incredibly important that your work reflect your own aesthetic. Be yourself. Try not to look at what's on the market already, and just do your own thing. Be able to describe how you would use the fabric, how you think others would use it, and how it can be marketed. And most importantly, be willing to put yourself out there and possibly fail a couple of times. I kept telling myself that the worst thing I could hear would be, "No, thank you," and I'd just move on from there. Have you begun work on your next line of fabrics? When can we expect to see them available for sale? I'm very pleased to say that the next group is on the way. There should be color cards ready within the month for distributors/vendors, and I believe it will hit stores sometime in early 2010. I can't wait to be able to show it! You can view and purchase Bari J. 's "Full Bloom" fabrics at Pink Chalk Fabrics and at the Fat Quarter Shop. 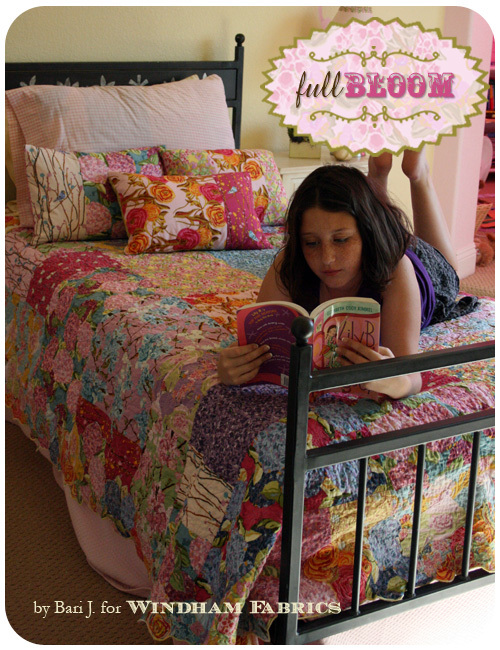 Bari's blog includes some gorgeous photos of quilts and pillows made up in her fabrics. You can also view and purchase her finished bags in her online shop.